Women’s handbag is not just a bag but a treasure holder that is having a home away kit. There can be many things in a female’s purse only other than cash or napkins. Depending on the requirements, ladies carry many things with them. Every handbag should have some of the essential items that are necessary for everyday maintenance. It’s not always the priority but necessity that women need to have some specific products with them. Here are the fifteen most essential products listed that are necessary for every female to meet any beauty fix situation anywhere easily. 1 Mirror Above anything else, you need to have a small mirror that will help you every time to keep a check on your beauty touch-ups. 2 Foundation and Concealer The very basic of makeup is the foundation and concealer. It is necessary for every lady to have these two available in the bag. It is necessary for you to have the foundation and concealer of the matched tone. 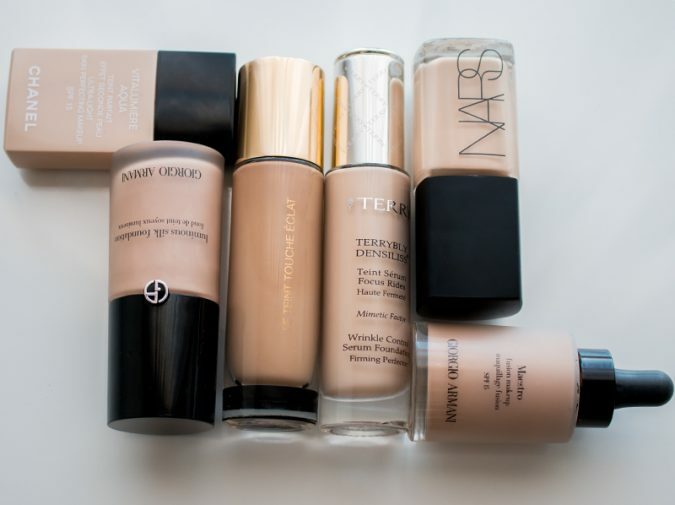 Not every foundation is your type, so make sure having it with you to be fresh and ready for an instant event. 3 Primer The next important thing in handbag makeup is the primer to deal with the skin pores. To avoid the rugged look of your skin, this will help you to achieve the smooth and radiant looking skin. You can apply the primer after getting done with the foundation and concealer. 4 Your Blush Brush The next thing is the blush brush; remember you are not in a position to use anyone’s brush. Makeup products are personal stuff and shouldn’t be shared at all. You need to have one with you. Make sure to get a brush that fits your bag, and it will help you with multiple purposes. 5 Best of Your Lipsticks Not all the shades of lipsticks you can carry in the bag. Here you need to choose the best one. Pick up a lipstick shade that goes smoothly with your daily routine look and has it all the time with you. You can do some experiments with one shade at the time by making it lighter or darkest. But, you need to pick up the suitable. 6 A perfect Lip Gloss You can add on a lip gloss to the accessories in the bag to add some sparkles in your look. At times you can make a difference in the look by using some glitters. Make sure to have a little different but coordinated lip gloss to make experiments or combinations with the lipstick. 7 Ideal Nail Paint While working by putting on the nail paint have the chances to get it chipped, and this is simply unfortunate. In this case, you need to have the nail paint available in the bag. You can fix it as soon as it got chipped. 8 Eyelash Curlers To have a bold-looking eye mascara seems to be an effective product that you can have. But, you wouldn’t always like to put on some concentrated solution on the lashes. Little curls with an eyelash curler help a lot to make an instant change in your lashes. 9 Mini Hairbrush For a long day outdoors you need to have your hair set up again and again. Make sure to have your mini hairbrush or comb that will help you with managing hair. 10 Hair Bands Hairs can be a problem at times when its unannounced wind or you have long working hours. In this scenario, it’s necessary to have the hair bands available with you to make them tied nicely within no time. Moreover, you can help anyone else with your spare hair bands. 11 Multifunctional Cream Sometimes it’s not possible to go through all the basic details of makeup like foundation, concealer or primer. So, you can have an instant option available that will help you to get set go with your beauty look. It will work as a foundation and primer as you to make your skin look plain and smooth. 12 Pocket Perfume It is a good idea to invest in pocket-size perfume to avoid any embarrassment. Mostly in summers, things get a little difficult when it is about managing your long work hours and meetings altogether. The perfume helps you to make the quick move and get going. 13 Nail File A good nail file is a rescue kit for you that will help you to treat the chipped nail. You will be able to settle up the corners and edges to prevent any further loss. A nail file can help you with many things other than just filing nail. 14 The Blush on the Mini Kit You need to have a mini blush on the kit with some natural and basic shades to have a natural and easy look all the time. You can use these blushes as eyeshades to coordinate the ultimate look. Make sure that you are available with perfectly coordinated products. 15 Liner Pencils A good liner pencil is quite helpful at times for a beauty makeover. You can get the instant liner done and will be able to add on highlighter for the eyes. Moreover, to get instant Smokey eyes, the liner pencil will get you great support. Other than the black shade, you can have some other basic shades that will help you with many looks.Final Verdict Carrying the beauty products in your handbag can save much of your time and help you to be ready for the suddenly occurring events. It is necessary for your skin to use your products. Sharing the personal beauty kit is strictly prohibited since this can cause infections and skin problems.